My crojo has gone missing. Do you know what crojo is? It stands for "crochet mojo" and, as with so many things, I didn't know it was "a thing" until I saw someone mention it on instagram. It's that feeling when you're so into a project you dont want to put it down at all, when you're full of inspiration for what to make, when you're generally just so crochet-y. Usually, that's me. Since baby 2, not so much. It's okay, I know exactly why it's happened to me at this time. Crochet is my Creative Thing, but it's hard to be innovative and original when you're so sleep-deprived you can barely string a sentence together. It all goes in phases, doesn't it, and in the meantime I'm thankful I have knitting as my Making Thing. So when Emily Littlefair (who you may know as The Loopy Stitch) asked whether I'd like to take part in a virtual tour for her new book, I jumped at the chance. Emily's IG page is full of gorgeous crochet, and I thought, what better way to try to tease my crojo back but with one of her patterns? 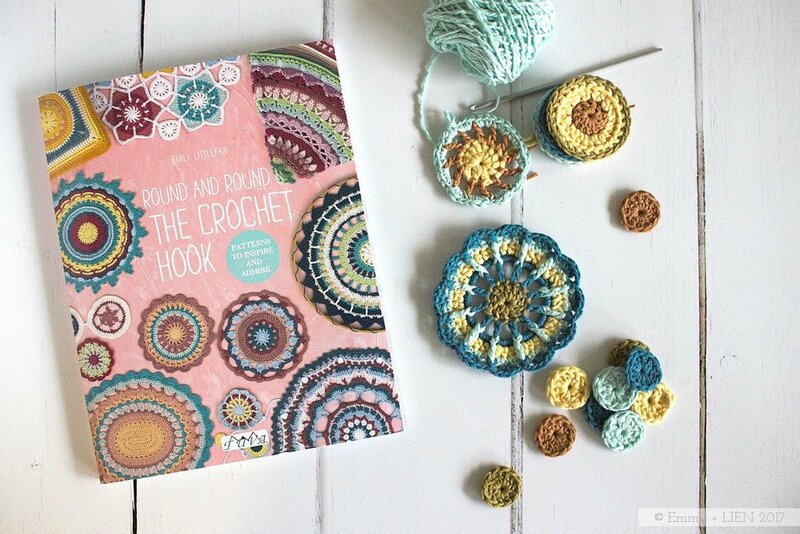 The new book is called "Round and Round the Crochet Hook", and contains 19 patterns that are all worked in the round. Most of them are small, reasonably quick projects, but there is one stunner of a blanket as well. Each pattern comes with detailed written instructions, complete stitch charts, and clear project photos. At the back of the book there's a handy "Crochet Basics and Techniques" section as well. When I received the book, the first thing that struck me was how pretty it is. As you'd expect from Emily, the colour palettes are very, very beautiful, with just the right balance between bright and sophisticated. We're in the depths of gallingly-grey November days here, and even just flipping through the pages is a enough for a bit of a visual pick-me-up. The other thing I really like is how clever the whole thing is. I've always admired crochet mandalas, both for how they look and for their meditative round-and-round-and-round construction - but I don't often make them because, well, what do you do with them all? Emily has anwsered that question for me: you make cushions, coasters, table runners, wall hangings... And you end up with truly beautiful as well as usable pieces for the home. In the end, I chose the Spotty and Dotty garland as my first project. I'm using bits of leftover Vinnis Colours cotton and bamboo because I just love the colours. We're doing up the boys' room at the moment, so that's where it will go, assuming I can bear to part with it! I'm pleased to say I'm really enjoying making it, to the point where I'm already toying with the idea of making them a rug from the book in matching colours. Round and Round the Crochet Hook by Emily Littlefair is published by Tuva Publishing and available to buy now. Thank you to Emily and Tuva Publishing for giving me the opportunity to review this lovely book and take part in the virtual book tour (for a full list of participants, click here).